Filtration of plastics with slide plate or continuous filters. Rebuilding of extruders and downstream extrusion equipment—We’ll do the job or show you how. Troubleshooting machinery and processes—Why won’t it work and how do I fix it? Screw design, replacement screws, and screw rebuilding. Acquisition of new extrusion machinery made by others, including sources for parts, components or complete machines—We can help you buy it right. New extruders and downstream extrusion equipment—Our experience is broad and our network is awesome. 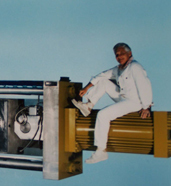 We come with a lifetime of machinery processing and industry experience. How can we help you? Recycling and re-pelletizing—We can build a plant for you or we can show you how. To contact Jerry Berlyn, click here .